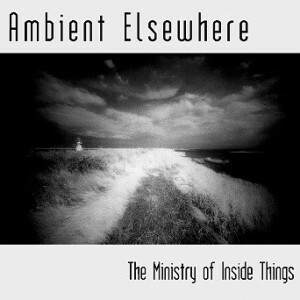 Ambient Elsewhere (2008) feels dark and isolated when compared to the two earlier releases by The Ministry of Inside Things. While Everlasting Moment explored the edges, dynamics and tension of space and atmosphere, and Contact Point embraced the more unified themes of cosmic, biospheric and macrocosmic interaction, Ambient Elsewhere moves through a strange new territory in-between and outside of traditional Spacemusic. Drawn from a range of chilling themes, this album sonifies wintertime, desolate landscapes and the soul’s midnight. Moving through the timbral badlands of the empty quarter, Ambient Elsewhere offers up a courageous intimacy. Always bringing their own influences and innovation to the music process, MoIT produces a sound that is uniquely individual and personal. The Ministry of Inside Things released this double CD at their performance at The Gatherings Concert Series on 20 September 2008. The music from Ambient Elsewhere has been drawn from several tour performances and features definitive live versions of classic MoIT pieces like “Love Attack” and “Naylor’s Run”. The album contains two one hour long suites of space music and easily flows through a variety of themes, energy levels and styles.